An Indiana native, Marion McKinley Bovard (1847-1891) was the eldest of 12 children, six of whom became Methodist ministers. He arrived at his life’s work in a roundabout way, first teaching school, then studying medicine and practicing as a physician before turning to the ministry. To enhance his ministry, he returned to school and earned his bachelor’s and master’s degrees from Indiana Asbury University (now DePauw University) in 1873. 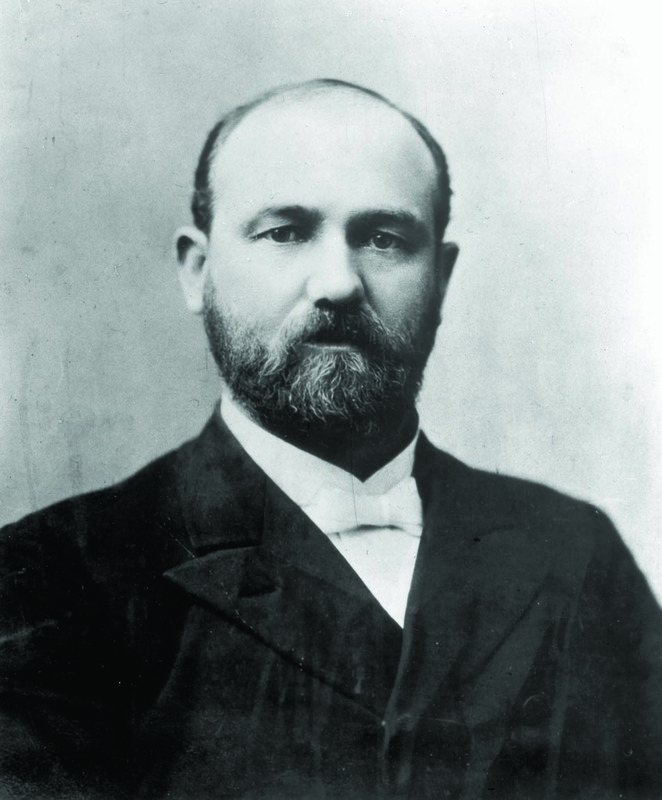 After graduation, he and his new wife, Jennie Allen Bovard, were en route to a ministerial appointment in Arizona when they met the Reverend John R. Tansey, presiding elder of the Los Angeles District of the Methodist Episcopal Church, who persuaded them to stay in Southern California. Bovard subsequently held postings in Riverside, Compton and Los Angeles. In 1879, Bovard joined Judge Widney and other community leaders in planning the creation of a liberal arts college in Los Angeles under the jurisdiction of the Southern California Conference of the Methodist Episcopal Church. Bovard was elected USC’s first president on September 3, 1880. He also served as chair of mental and moral science. Bovard’s administration saw the advent of the community’s first electric light, telephone no. 54 (“connecting the university with all parts of the city and surrounding country”) and several new facilities, including a dormitory and a “permanent” brick building known as Old College. Thanks to spiraling real estate values, USC also expanded through the development of satellite campuses — in locations ranging from Ontario to San Fernando, from Escondido to Tulare — although this ambitious growth came to an abrupt halt after the bursting of the real estate boom in 1887. California’s subsequent economic depression plunged USC into a protracted financial crisis. Enrollment dropped, and there was considerable turnover among the faculty as well as the board. After 11 years at the university’s helm, the pressures of steering USC through economic booms and busts took its toll on Bovard’s health; he died in December 1891. Marion McKinley Bovard is inaugurated as USC’s first president on October 5. On October 6, the university formally opens, with 53 students and 10 faculty. A college of liberal arts, a university band and a debate team are established. USC’s first dormitory, Hodge Hall, is opened. A department of music is founded. USC holds its first commencement, with a graduating class of three students; a woman, Minnie Miltimore, is named class valedictorian. USC’s College of Medicine, the first in Southern California, is established. Eight alumni form USC’s first alumni association. USC receives a gift to create its first endowed faculty position, the John R. Tansey Chair in Christian Ethics. USC’s first “permanent” building, known as Old College, is dedicated. USC plays its first football game and trounces the opponent 16:0.